Tomorrow is Emma's 13th birthday. I can't even believe that. It is hard to fathom what it would be like to have two teenagers in my house. There are times, like now, when the grief is doubled because I am missing not only the Emma we all knew but also the Emma that we might have known if not for SLO. 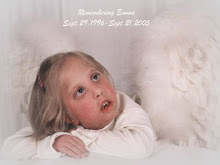 Smith-lemli-opitz syndrome took that Emma away before we ever even knew her. On nights like tonight I think about that girl and wonder what she would have been like. I try to imagine what it would have been like for Allie to grow up with a sister to laugh with, fight with, play with, someone to talk to when mom just isn't cool, which is probably most of the time. I didn't know her but I miss her. So very much. Thirteen. Such a milestone. Emma didn't get to reach this milestone but in a way I am reaching it for her. Thirteen years on this journey of searching, reaching, growing, trying to understand why this happened. I can look back and see that I have grown but I haven't arrived. I am still questioning and sometimes a little angry. I guess maybe kind of like a thirteen year old might be. I never got to know that Emma without the SLO but I did know and love Emma exactly the way she was. She was such a sweet, joyful little girl. I can only imagine how much more sweetness and joy would have filled all of our lives if she had been whole and able to show us just who she was inside of her broken body. The only peace I can find on nights like tonight is the promise that I will see her again. And I will have the chance to know her for everything she is and it will be more than I can imagine.